I found this little gun at the gun show in Tulsa. I kept going back to the table to look at it because I had never seen one before, and I finally made the guy an offer on it. He told me he had bought it in 1967 and had never fired it. I brought the gun home to research it and found virtually nothing. The Dictionary of Guns and Gunmakers says “Pretoria Arms Factory, Pretoria, Republic of South Africa. 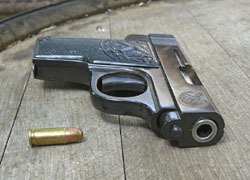 Maker of the .25-calibre Junior, or P.A.F. pocket automatic pistols.” That told me nothing more than I had already gleaned by reading the slide inscription on the gun and talking to the guy who sold it to me. A month later I was looking through J.B. Wood’s Troubleshooting Your Handgun, and there it was, a precious five paragraphs of information on the PAF. The “Junior” was designed by P. Nagel, a Dutch immigrant to South Africa, and was made from 1954 to 1957. 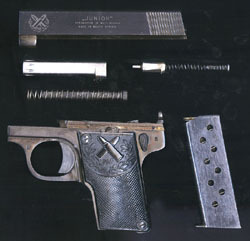 The design is almost identical to the Browning FN Model 1906 and Colt Model 1908 vest pocket pistols, minus the grip safety. The three barrel lugs on the Browning are reduced to one, much like the CZ models 1936 and 1945. 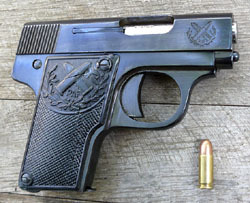 The disconnector is a vertical projection from the trigger bar like the one on the 1934 Beretta (and other Berettas of the early 1930s). Wood says the only original feature of the PAF is a small pin that is cammed upward by the manual safety to lock the slide. The gun is about the same length as the “Baby” Browning, but has a larger grip. The magazine holds 8 rounds. 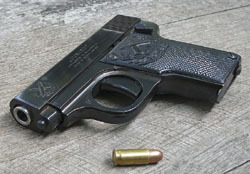 The early PAF pistols had fixed sights integral with the slide, at least through serial number A1500. At some point after that the sights were eliminated and the gun has only a sighting groove on the top of the slide. The PAF is a bit awkward in the hand. It’s very slim, which is nice, but the gun sits high in the hand, rather than low, and the magazine base plate falls right in the middle of my ring finger, making it uncomfortable to grip tightly. The right side grip on my gun is cracked. The grip is too thin overall, particularly at the corners where the screws go. The cracking seems to have been caused by shrinkage of the cheap plastic rather than rough handling. Replacement grips are available from Triple-K.
Wood states that some of these guns may not have had adequate heat treating as he has seen one gun where the striker spring base and the lower projection at the front of the slide were deformed from having been shot extensively. He also said he had seen a magazine where the thin sheet metal had split at the back. Wood felt the pivot points for the trigger and sear were not well placed, indicating to me that the designer was inexperienced. My gun had not been properly oiled and had started to rust on surfaces where the metal was not highly polished. This is particularly visible in the scan of the gun components. I disassembled the gun and oiled it thoroughly, but I still haven’t managed to remove all the rust. While the gun seems reasonably well made externally, inside the machining is rather rough and there are sharp edges that catch threads from my cotton patches and cleaning cloths (I see this on other pistols such as Llamas and other cheap Spanish pistols). I ran an oiled patch through the barrel, which came out absolutely clean, indicating the guy told me the truth when he said he had never fired it. The PAF logo, two crossed cartridges above the PAF monogram surrounded by a wreath, appears on both sides of the slide, as well as on each grip. The serial number is on the back of the grip frame. Hogg & Weeks state that about 10,000 Juniors were made. I’ve been collecting serial numbers, and so far A10762 is the highest recorded. Please write if you have a higher serial number. * Apparently there are a few PAF .32 prototypes in existence, but the .32 version was never a production gun. Some guns are marked “BRF” on the grips instead of “PAF”, and a few are stamped BRF on the slide but may retain the PAF grips. 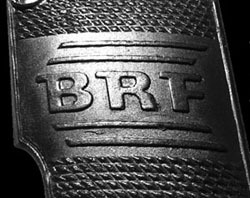 Some have speculated that BRF stands for Bristol Firearms Company, which sold the PAF under their name in the U.S. However, a gentleman from South Africa has recently informed me that the remaining stock and tooling for the company was purchased by an employee whose name was Bertram Rudolph Freiling. The letters BRF are his initials. It has come to my attention that at least one BRF pistol has a cocking indicator, a small pin that protrudes from the rear of the gun when the striker is cocked. I would appreciate hearing from anyone with a gun like this. Make sure there is no bullet in the chamber of the gun, or in the magazine. Turn the safety lever down and pull the trigger. The gun should not be cocked when disassembled. With the barrel lug lined up with the slot in the slide, twist the barrel a quarter turn clockwise (as you face the front of the gun). Note: These guns are often difficult to disassemble and even more difficult to reassemble. The slide lock pin (mentioned in the second paragraph) should be pressed down by the slide when you push it forward, but it sometimes gets stuck and may need to be lubricated. * I’ve had responses from individuals owning serial numbers A0231, A0322, A0732, A1351, A2495, A3689 (w/ white grips), A5150, A5125 (w/ BRF grips), A5431, A5515, A5560 (w/ BRF grips), A6714, A6956, A7268, A7270, A7389, A7660, A8144, A8709, A8826 (BRF), A8840, A10442, and 10762. Copyright 2008-2017 by Ed Buffaloe. All rights reserved. Troubleshooting Your Handgun, by J.B. Wood. Follett, Chicago: 1978.